LWV Duluth is opposed to the sale of the gas utility. 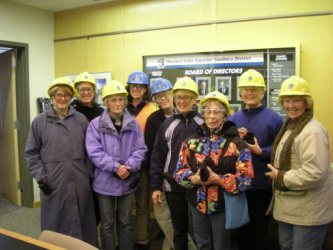 LWV Duluth supports development of a comprehensive plan for reinvestment in Comfort System utility infrastructures. The plan should be an integrated, coordinated plan of action with specific timelines, identified and committed fund sources to maintain each of the four utilities in standard operating condition at all times, and be developed with input from citizens and businesses, as well as from utility workers and management. *Reduce temporary repair costs; instead, devote resources to system replacements to achieve standard operating function. *Replace dysfunctional sanitary sewage collection infrastructures and storm water systems not already under federal and state correction orders. *Replace antiquated underground utility infrastructures as streets are replaced. *Expand water testing to include organic and inorganic substances entering Lake Superior watershed from new mining and other human activities. *Expand citizen understanding, including private and commercial fee payers, with children and youth participation, to encourage water conservation and reduce waste contamination. Every City resident and business depends upon the quality of service, condition and efficiency of the whole of our commonly owned infrastructure systems. City infrastructure deserves priority status from available City revenue sources. 1. Adequate grant sources are not available in a timely way. 2. Need is in accordance with a long-range capital utility improvement plan. 3. Careful discerrnment is reached between needs and wants in prioritizing utility bond issues with other City bonding obligations. 4. There is adequate projected revenue for debt pay-back without untenable rate burdens thrust on low-income households. 1. An increase proposal demonstrates that efficiency has first been adequately sought out in the utility requesting the increase. 2. Accurate accounting numbers have been clearly laid out so the public will understand why the rate is increasing. 3. A short and long-term financial plan for the proposed rate increase has been presented in an understandable way to the public. 4. A public discussion and debate has occurred prior to any utility rate increase, including methods to protect particularly vulnerable consumers.